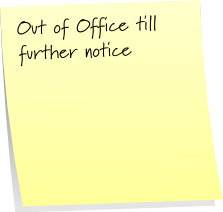 Got in the office to find a colleague was going to be on long term sick this morning, the boss asked, “Can we turn on his out of office?”. I could have simply changed the users password and logged into OWA and done it, but executing some PowerShell would be more elegant. Note: You must be in one of the following groups to carry out this procedure, Organizational Management, Recipient Management, or Help Desk. Note: Remember the dates need to be in ‘American date format’ or the command will fail.